Origin and Habitat: Mediterranean coasts of North Africa, Europe, and the Orient, and Red Sea coasts, extending north to Jordan Valley. It is also present in the Middle East, including Iran and Pakistan. It also grows in eastern Africa. Altitude range: 0 to 400 metres above sea level. Habitat and ecology: Arthrocnemum macrostachyum grows in coastal and inland salt marshes, alkali flats, and other habitats with saline soils. In Pakistan it grows in the muddy coastal swamps immediately inland from the mangroves (Avicennia marina) that border the coast . In the delta region of the Mediterranean coast of Egypt, it dominates some plant communities in the salt marsh habitats . Arthrocnemum fruticosum var. macrostachyum (Moric.) Moq. Arthrocnemum fruticosum var. glaucum Moq. 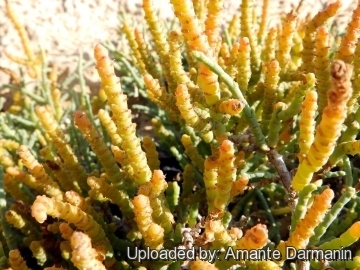 Description: Arthrocnemum macrostachyum is a much branched, apparently leafless (fused leaf pairs covering the nodes), perennial, monoecious, glabrous, halophyte shrub, 0.3-1(1.5) m high, with stout, very succulent stems and branches erect to ascending, sometimes rooting at base. Spikes in fruit numerous, 2-4 cm long, 5 mm broad, “rough,” but less so than the related Arthrocnemum Fruticosum. 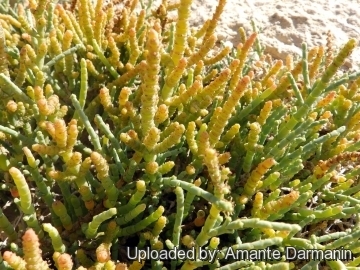 The plants are salt-tolerant and grows well at a range of salt concentrations. They often form a low-growing cover with the foliage changing colour throughout the year between various shades of green, yellowish-green and red. This species has a confused nomenclatural history which is set out more fully than usual. Stems: The plants have horizontal woody stems up to 1 cm in diameter, woody, densely branched, into erect to ascending, jointed, succulent green branches, 3-4 mm in diameter, that may produces long, thread-like, horizontal, adventitious roots when vegetative organs become buried. The internodes are cylindrical or club-shaped, up to 7 mm long, glaucous-green. Leaves: The leaves are small and scale-like, clasping the stem but with the tips free forming short wide 2-lobed cupule. Inflorescences: Flowering branches erect with terminal, cylindrical, obtuse spikes 30–60 mm long 3–4 mm in diameter. Flowers: Minute, clustered in horizontal,opposed groups of 3 in the axils, protruding by up to 1/3rd the length of the internode within connate bracts from an undivided cavity, the central flower of each triad slightly larger. The dispersal unit is the group of connate bracts of each flower, somewhat quadrangular, wedge-shaped at base, with the seed loosely held below. Perianth conical 3-dentate. Pericarp membranous. Male flowers: Born on 2-3 cm long spikes. Stamen usually 1, anther about 0.8 mm long, ovoid, protruding from the joints. Female flowers: Produced in similar spikes, but with only stigmas protruding out of the joints. Perianth irregularly toothed or short-lobed; fruiting calyx spongy, about 3 x 2 mm, adherent to the horny pericarp. The flowers are wind-pollinated. Fruits: The fruit is small, has a membranous pericarp, and contains a single seed. Seeds: About 1-1.5 mm long, ovoid, somewhat compressed, black, shining, densely papillate, verrucose on back. 3) Wikipedia contributors. "Arthrocnemum macrostachyum." Wikipedia, The Free Encyclopedia. Wikipedia, The Free Encyclopedia, 9 Jan. 2017. Web. 16 Apr. 2017. 5) Zahran, M.A. ; El-Demerdash, M.A. ; Mashaly, I.A. (1990). 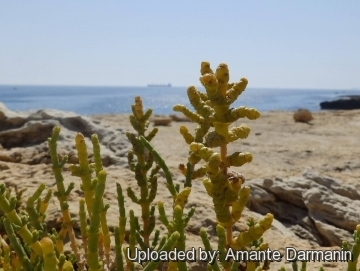 "Vegetation types of the deltaic Mediterranean coast of Egypt and their environment". Journal of Vegetation Science. 1 (3): 305–310. doi:10.2307/3235705. 7) Khan, M. Ajmal; Ungar, Irwin A.; Showalter, Allan M. (2005). "Salt Stimulation and Tolerance in an Intertidal Stem-Succulent Halophyte". Journal of PlantNutrition. 28 (8): 1365–1374. doi:10.1081/PLN-200067462. 8) Weber, D.J. ; Ansari, R.; Gul, B.; Khan, M. Ajmal (2007). "Potential of halophytes as source of edible oil". Journal of Arid Environments". 68 (2): 315–321. doi:10.1016/j.jaridenv.2006.05.010. 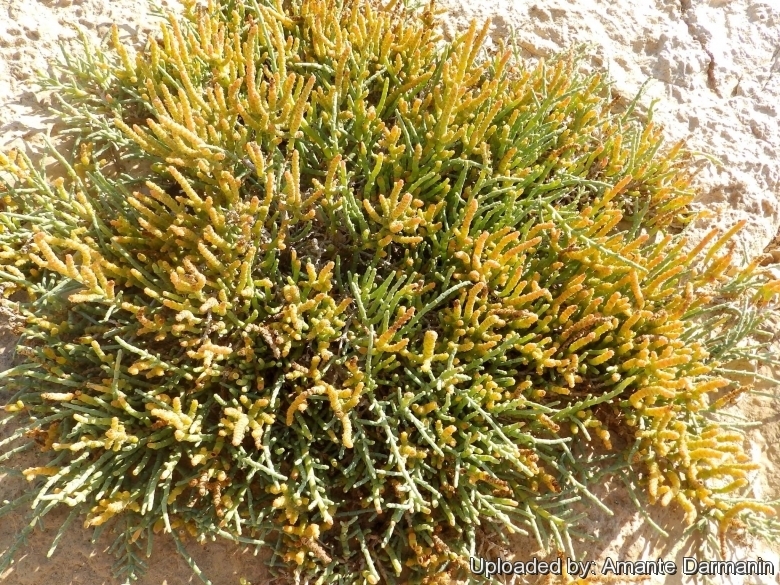 9) Gerald E. Wickens "Ecophysiology of Economic Plants in Arid and Semi-Arid Lands"
Cultivation and Propagation: Arthrocnemum macrostachyum may be cultivated as a salt tolerant ornamental  ...creating an aesthetically pleasing groundcover that also reflects the changing of seasons. The potential use of these species in an extensive green roof system in coastal areas would lead to additional benefits such as preserving and enhancing the local landscape character and supporting biodiversity. The seeds of A. macrostachyum contain between 22% and 25% oil, with an unsaturated fatty acid content of 65% to 74%, and are being investigated as a possible source of edible oil .